Price has been behaving exactly as expected now for over a week. We may have reasonable confidence in the current Elliott wave count. Volume analysis also supports it today. Summary: Upwards movement may end tomorrow at 1,268 to 1,270. Thereafter, a third wave down may begin. 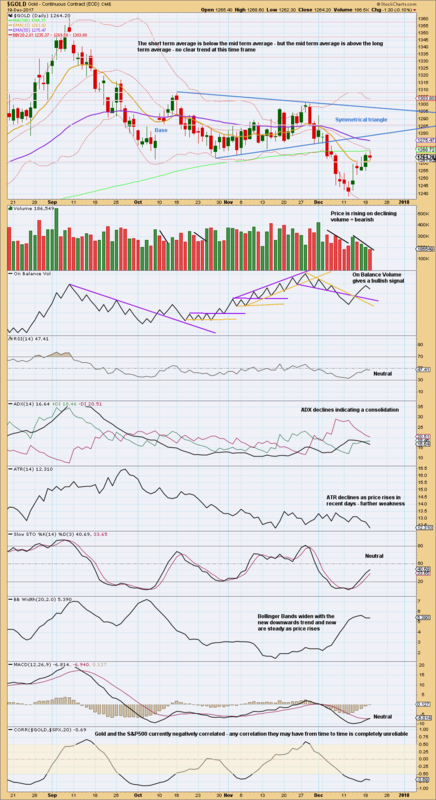 Last monthly charts for the main wave count are here, another monthly alternate is here, and video is here. 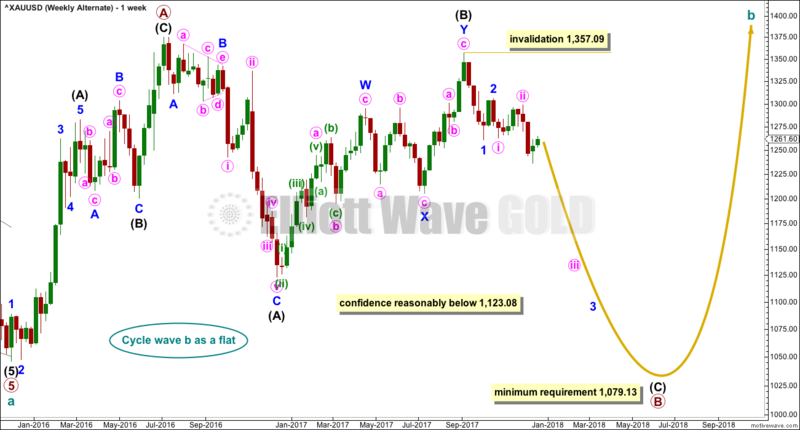 All wave counts expect that Gold completed a large five down from the all time high in November 2011 to the low of December 2015, which is seen on the left hand side of both weekly charts. All wave counts then expect cycle wave b began in December 2015. There are more than 23 possible corrective structures that B waves may take. It is important to always have multiple wave counts when B waves are expected. It looks unlikely that cycle wave b may have been over at the high labelled primary wave A. Primary wave A lasted less than one year at only 31 weeks. Cycle waves should last one to several years and B waves tend to be more time consuming than other Elliott waves, so this movement would be too brief for cycle wave b. The B-D trend line should have a reasonable slope for this triangle to have the right look, because the A-C trend line does not have a strong slope. A barrier triangle has a B-D trend line that is essentially flat; if that happened here, then the triangle trend lines would not converge with a normal look and that looks unlikely. Primary wave D should be a single zigzag. Only one triangle sub-wave may be a more complicated multiple, and here primary wave C has completed as a double zigzag; this is the most common triangle sub-wave to subdivide as a multiple. Primary wave D of a contracting triangle may not move beyond the end of primary wave B below 1,123.08. At its completion, primary wave D should be an obvious three wave structure at the weekly chart level. 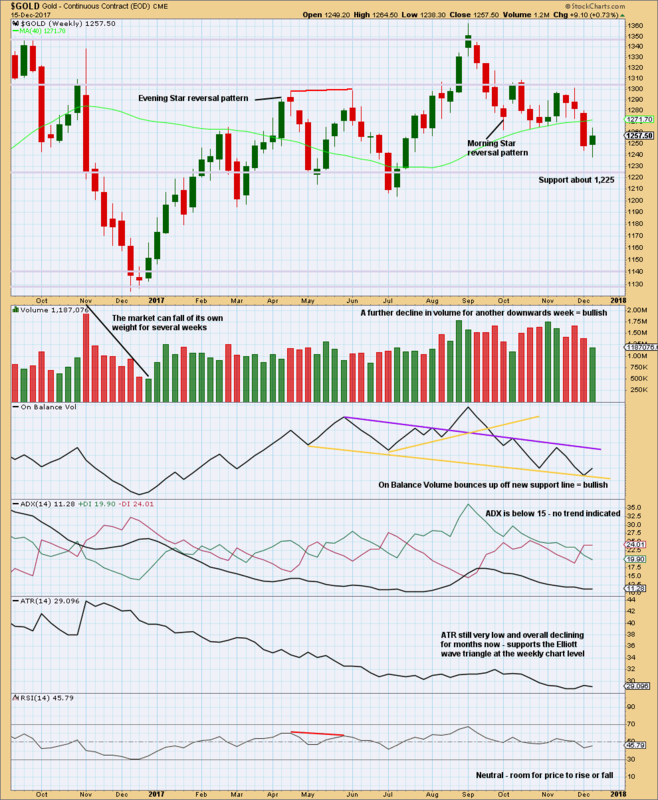 For this one weekly chart, two daily charts are presented below. They look at intermediate wave (B) in two different ways, and are presented now in order of probability. Both daily charts are identical up to the low labelled intermediate wave (A). 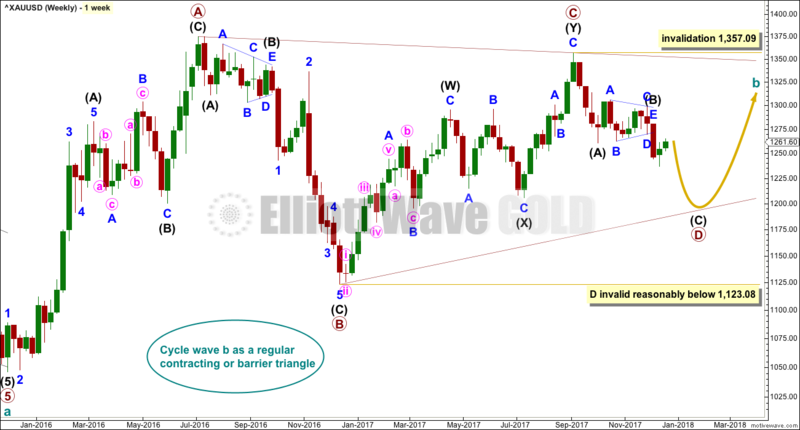 This first daily chart shows intermediate wave (B) as a now complete regular contracting Elliott wave triangle. This has support from what looks like a classic downwards breakout from the symmetrical triangle identified on the technical analysis chart below. The target assumes that intermediate wave (C) may exhibit the most common Fibonacci ratio to intermediate wave (A). Intermediate wave (C) must subdivide as a five wave structure. Within intermediate wave (C), minor wave 1 may now be complete. Minor wave 2 so far has lasted five days while minor wave 1 lasted seven days. Minor wave 2 may be over here and exhibit a Fibonacci duration of five, or it may continue a little further and be closer in proportion to minor wave 1 and not exhibit a Fibonacci duration. Intermediate wave (A) lasted twenty sessions. 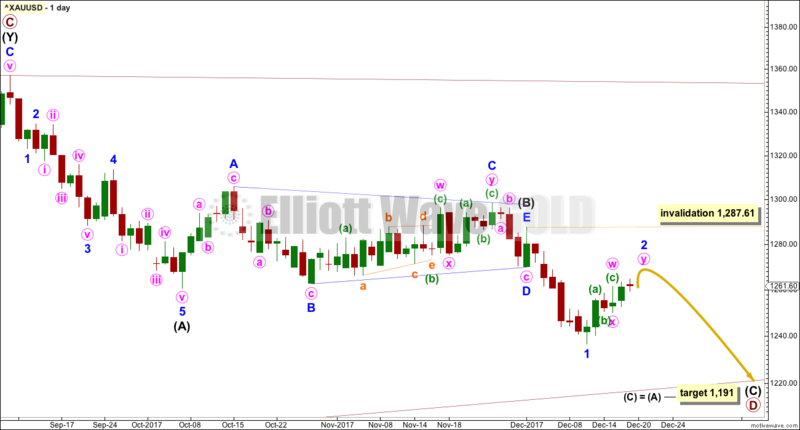 Intermediate wave (C) may be about even in duration as well as length, so twenty or twenty-one sessions looks likely. The next Fibonacci ratio in the sequence would be thirty-four, and it is possible intermediate wave (C) could be this long lasting. At its end, minor wave 2 may present an opportunity to join the downwards trend in time to catch a third wave down. At this stage, only one hourly chart will be presented. Yesterday’s alternate no longer has the right look. Minor wave 2 so far fits best as a double zigzag structure. These are very common. The second zigzag exists to deepen the correction when the first zigzag does not move price deep enough, and sometimes also when it does not last long enough. Minute wave w ending at only 0.49 of minor wave 1 and lasting only three days fits this description. Minute wave y is deepening the correction and taking up more time. The best fit channel as drawn in last analysis is no longer useful because price broke below the lower edge but only with sideways movement, so it was not a clear downwards break. The channel is redrawn. When this channel is clearly breached by downwards (not sideways) movement, then it shall provide an indication that minor wave 2 may be over and minor wave 3 may have begun. When the start of minor wave 3 is known, then a target may be calculated for it to end, but that cannot be done yet. Minor wave 2 may not move beyond the start of minor wave 1 above 1,287.61. It is very important to always consider an alternate when a triangle may be unfolding. Triangles are very tricky structures, and may even be invalidated after one thinks they are complete. It is still possible that intermediate wave (B) may be completing as a flat correction. Within the flat correction, both minor waves A and B are threes. Minor wave B has retraced more than the minimum 0.9 length of minor wave A. With minor wave B now a 1.54 length to minor wave A, an expanded flat is now indicated. Minor wave C of an expanded flat would most commonly be about 1.618 the length of minor wave A. Now minor wave C may be required to move price upwards to end at least above the end of minor wave A at 1,305.72 to avoid a truncation. A new high above 1,298.70 is required now for confidence in this wave count. 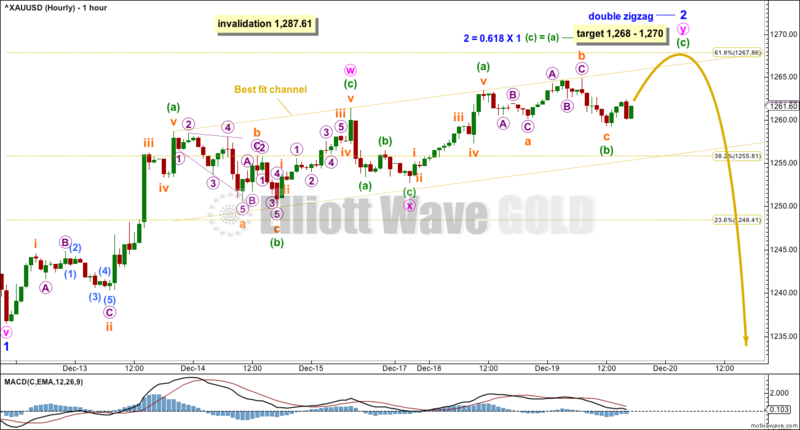 If the upwards wave does not reach up to 1,298.70, then this second wave count will be discarded. There should be something wrong or “off” about B waves. In this instance, the last downwards wave has some strength. 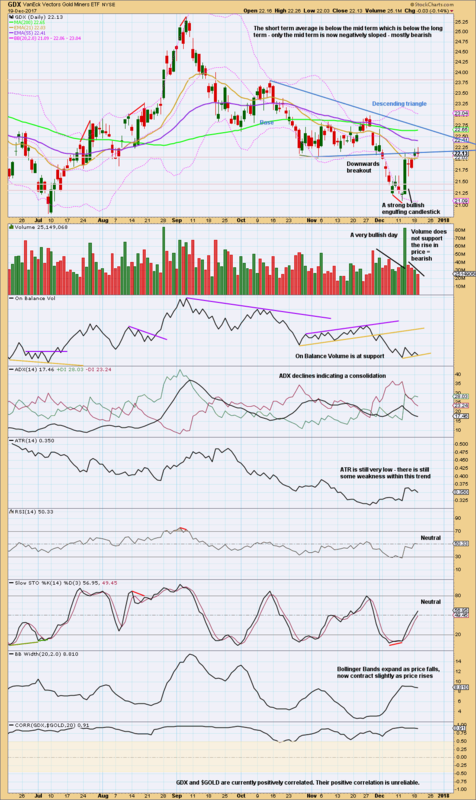 While the market fell of its own weight, On Balance Volume gave bearish signals. Classic technical analysis does not support this wave count, so it looks unlikely now. 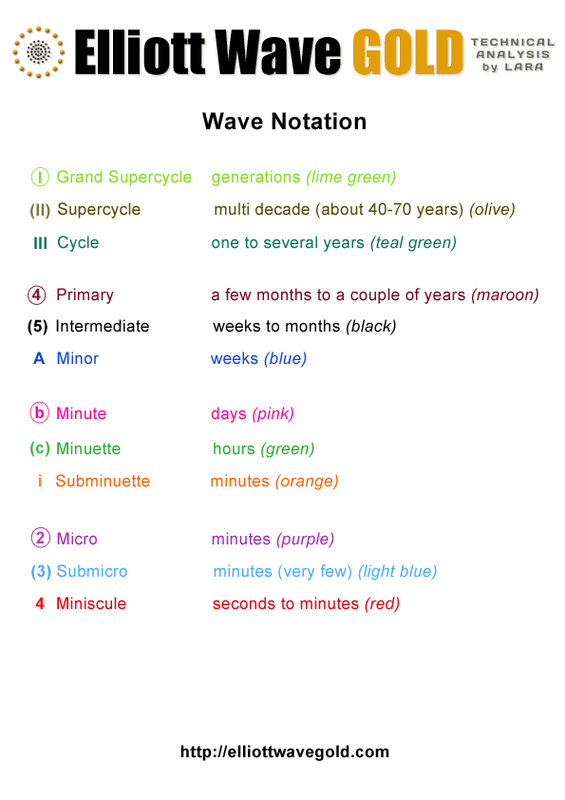 All wave counts are identical to the low labelled cycle wave a. Thereafter, they look at different possible structures for cycle wave b. Cycle wave b may be a flat correction. Within a flat primary, wave B must retrace a minimum 0.9 length of primary wave A at 1,079.13 or below. The market is falling of its own weight. Next support is about 1,225. The small real body of the last weekly candlestick puts the trend from down to neutral. The support line for On Balance Volume is redrawn. A bounce up this week may be bullish. While markets may fall of their own weight for considerable distances, rising price on declining volume is more of a concern. Price needs support from increasing activity of buyers for it to rise sustainably. So far, for the last four sessions, Gold price is rising on declining volume. This looks more likely to be a counter trend movement than the start of a new sustainable trend. This view is reinforced with ATR now also declining as price rises. This upwards movement looks weak. Coming after the symmetrical triangle and a downwards breakout, which had some strength, it looks like this movement is a bounce within a continuing larger downwards trend. A throwback to the lower edge of the symmetrical triangle is unlikely, that happens only 37% of the time. And so we should expect this bounce to end very soon before it gets that high. 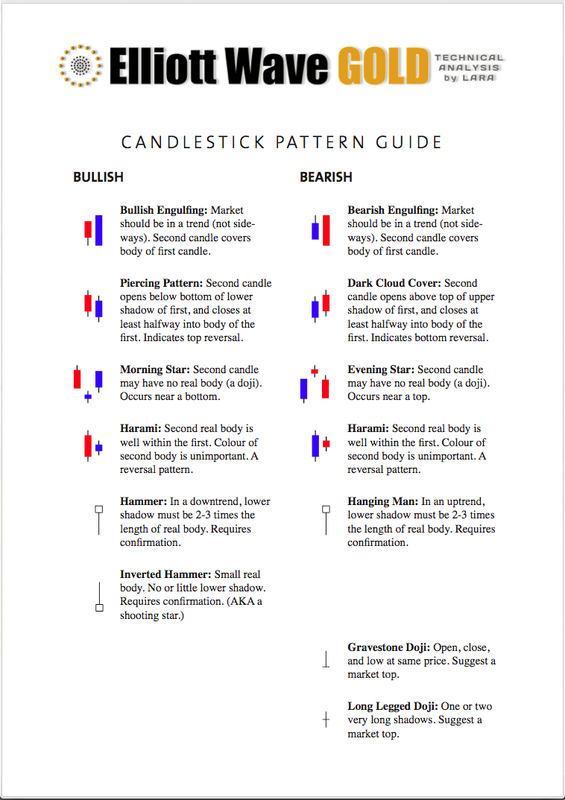 The small real bodies of the last two daily candlesticks puts the trend for the short term from up to neutral. Volume, ATR and Bollinger Bands all point to this upwards movement more likely being a counter trend movement than the start of a new sustainable upwards trend. That view could change if price starts to move strongly higher, but this is what the data in hand indicates today. Published @ 06:55 p.m. EST. Price continues higher towards the target for this upwards movement to end. Two hourly charts are provided today. They both expect the same direction next, only the Elliott wave structures are different, and both have the same target. 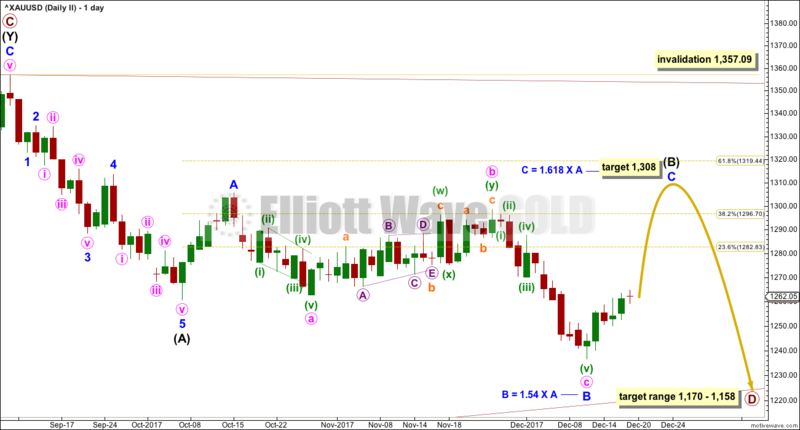 Overall, more upwards movement was expected; a slight new high fits the main Elliott wave count. Downwards movement during Monday’s session remained above the short term invalidation point on the hourly chart.